Susan G. Komen® N.O. Affiliate. Below is the letter that comes along with the Flock. We are the pink flamingo flock! Our goal is to raise money and to have some fun! YOU’VE BEEN FLOCKED FOR THE CURE! Susan G. Komen® New Orleans. You’ve been flocked by ___________________! fly to our next stop before the 2019 Komen Race!!! For a donation, YOU too can flock your family, friends & neighbors! or call the Komen office at (504) 455-7310. 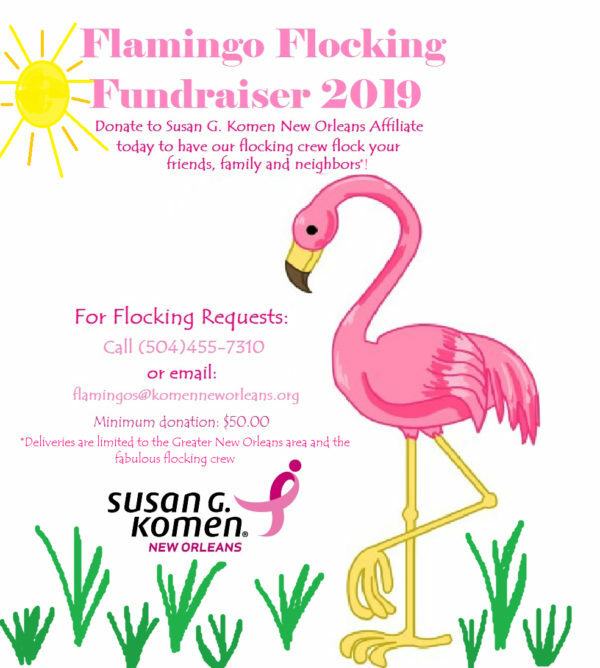 Please make your check payable to: Susan G. Komen New Orleans and write FLAMINGOS on the memo line (minimum donation: $50.00). 4141 Veterans Memorial Blvd., Suite 202, Metairie, LA 70002.